The ... total September exports of $132.0 billion and imports of $168.4 billion resulted in a goods and services deficit of $36.5 billion, up from $30.8 billion in August, revised. September exports were $3.7 billion more than August exports of $128.3 billion. September imports were $9.3 billion more than August imports of $159.1 billion. 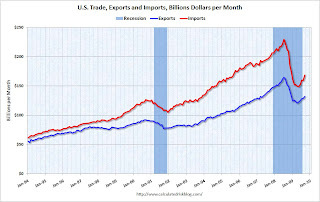 The first graph shows the monthly U.S. exports and imports in dollars through September 2009. Imports and exports increased in September. On a year-over-year basis, exports are off 13% and imports are off 21%. 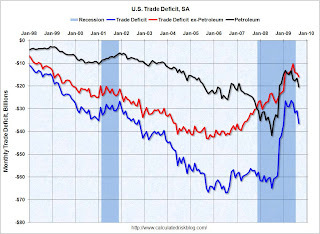 The second graph shows the U.S. trade deficit, with and without petroleum, through September. Import oil prices increased to $68.17 in September - up more than 50% from the prices in February (at $39.22) - and the seventh monthly increase in a row. Import oil prices will probably rise further in October. The major contributors to the increase in the trade deficit were the increase in oil prices, and more imports from China. Also - the deficit is higher than expected, suggesting a downward revision to Q3 GDP.